Obama is expected to be in San Bernardino on Friday for a private meeting with families of the victims of the terrorist attack. We are organizing a protest. The details will be posted here when available. Keep checking back in case the plan changes. Keep checking this site for updates when we get more information. We will probably be protesting on the next intersection north of the IRC on S. Waterman Ave.
We will have about 50 extra signs, if you need a sign. Some will likely be protesting before the start time listed above, if you want to start early, say in the early afternoon. Download map of the protest site here. NOTE: We are not yet sure where the private meeting of Obama and the families will actually take place. If the meeting takes place at the IRC, we will keep a respectful distance, so as not to disturb the families. The meeting place is tentative and may be changed, if a better protest site is identified. If no better place is identified, then the IRC is a place that is highly symbolic of the attack and that is why we will be meeting there. Some, so-called “conservatives,” are trying to disrupt the protest in the name of “respect for the families.” The leadership of the local Redlands Tea Party “Patriots” is trying to quash the protest. They do not offer any real help to us, just opposition to the protest. We do not intend to be disrespectful of the families. On the other hand, we think it is extremely disrespectful of the families of the victims for Obama to show up for a meeting without admitting that his actions and policies gave rise to the ISIS terrorists, who murdered the members of their families. His same actions and policies, which continue unabated, will certainly cause the deaths of many more innocents in the future. We respect the grief of the families. However, we also want to respect and do as much as we can to help the families of victims to come, who will lose more loved ones, if we do nothing, due to Obama’s perverse preference for radical Islam. We want Obama to stop his support of radical Islam, not just exploit the families of victims for his own propaganda purposes. Obama is, to a significant degree, responsible for these victims. He ought to admit that to the families and sincerely apologize to them for contributing to the deaths of their loved ones. Traffic to the this web page is good and we expect a pretty good group to show up. So, come on down and help us. 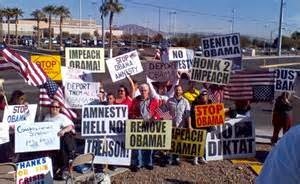 It should also be noted that some local Tea Party groups are nonprofits, or affiliated with nonprofits, and they avoid any controversial protests against Obama. Run by bean-counters, attorneys and accountants, they fear it will impact their nonprofit status and future fundraising potential. This protest is being organized by patriot volunteers. For that reason, we don’t have sleazy attorneys and accountants running the show. Amen to all of you. I will do my best to participate! Lets all send that ISIS-lover a message and then to hell! Tony, thanks. Any changes to the time or location will be posted here. Brady, please keep checking this page for time/place updates, in case anything changes. If there is ANY way that I can go, I’ll be tgere! God bless you and protect the event.